Globaltec Formation Bhd is an auto parts manufacturer. Its business is divided into four reportable segments namely Integrated Manufacturing Services (IMS), Resources, Energy, and Investment Holding. The IMS segment deals with designing and manufacturing automotive components, and it also consists of the precision machining, stamping and tooling arm and the semiconductor division. The Resources segment includes the oil palm plantation and coal mining divisions. The Energy segment includes oil and gas exploration, production, and services. Lastly, the Investment Holding segment manages the company's investments in subsidiaries. The company has operations in many countries, but it generates the majority of its revenue from the IMS segment in Malaysia and Indonesia. Depeche Finally... the new chapter... let's see how it fares. Depeche I have a feeling this counter may pull it off. derrickinvestor pull it off? u mean dropnto 0.04 again? commonsense If you can look pass all the corporate announcement of new ventures and corporate exercises (share consolidation and free bonus warrants) and look at the company's fundamental, Globaltec is still a loss making company since at least FY2013 which is the year after the merger of AutoV, AIC Corp and Jotech Holding. It was surprising to see that the company turn straight away to loss making in 2013 given that prior to the merger of the 3 companies, they actually made a combine profit of RM37.6mil PAT in 2011. I am not sure what went wrong in just 6 months after the merger. 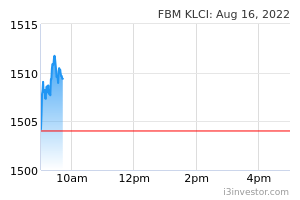 They still managed to make profit in the quarter after the merger but was not as high as before at only RM2.2mil PAT. Then it just got bad in 3Q13 when they posted their first time loses as a new company. Can anyone provide some clarity on this? I think it is better for those that are interested to wait for them to post a more sustainable profit before you invest into the company. If not, at least wait for a clearer picture on the development of the Tanjung Enim field which is supposed to be the company future growth catalyst according to management. The last development that i heard off was the completion of the exploratory/test drilling in the Muralim block last week by Nuenergy. I think they are still testing to see how much recoverable gas reserve are in the tested well. There is also another well that they are currently testing but is yet to be completed. This is still not certain in term of recoverability. There could be gases in the 2 wells but might not be financially viable to extract. Hence why i think you should wait for the development of the well testing first before investing in this company. For those already invested, you need to be prepare to face some market volatility in the short term. Maybe those invested could provide clarity on what are the other catalysts for the company besides the Nuenergy venture. If you are looking to diversify your portfolio a bit (at least until the result of the Nuenergy test is out), i would recommend you to look at MBMR. Depeche Pull it off =succeed. Depeche Yup... better observe first... for those bold enough....i will only enter it goes to 0.43 and below. vinceooi anyone know when will they issue the bonus warrant ? Depeche Strong closing. This counter should be bullish in the short term at least. Depeche But am little sceptical about current bullishness....when it has yet to prove that the company has truly turned around. AyamMuda1 Before conso now is 3 sen? AyamMuda1 Mkt cap 646 million correct? chery Any idea when warrants will ne listed? kslim42 Mana Ayam tua ? Tim2812 So good or bad? Depeche QR will be out soon...will have a clue what to expect for future earnings. DreamCapturer Itu AyamTua sutah gaya lor. Gng gng gaw gaw gaya yuga lor. Tia pinya image pun sutah bikin massive overhaul also lor. paktua73 hehehhe alaa time jadi ayam tua group..
ayam tua jantung tua but hati alaa muda..
pro777 any one know about SAUJANA E&P company that invest in NuEnergy? Upon completion of the proposed share placement, the group’s direct and effective interest in NuEnergy will be diluted from 64.7% and 51.7% to 31.7% and 25.4% respectively, GFB said in bursa Malaysia filing today. This represents a dilution in direct and effective interest of 33.0% and 26.3% respectively, which represents a material dilution of the group’s equity interest in a principal subsidiary under Paragraph 8.21 of the Main Market Listing Requirements of Bursa Malaysia. Upon completion of the proposed share placement, NuEnergy will no longer be treated as a subsidiary but will be considered as an associated company of the group. Leoleo is it a very excited development. the MD must be veli excited again and again . Iswan are this a good news? flyby Smells like a private plan behind the curtain. Placement price too low. NGY price came down to satisfy low price. Been waiting for pod for so long, selling price would be much higher if waited for pod. How convenient for some. Decision makers decide for whose benefit? 80% directors for Saujana who holds 51% stake??? Why sell 51%, there would be investors who may be willing to buy at higher price for minority stake considering everything is in place except for the pod. Surprise attack using shock tatics. RAT is presented as a warm and trustworthy furry creature by the board. Still 25% of profit is very good considering the size of CBM reserves. Glotec is also doing well in the other fronts. Perhaps there may be some who may feel cheated by the smiling faces of the board of directors. The chairman has a nice smile and honest look. flyby Socialize the risk (Glotec), privatize the profits (Saujana) may apply here, who knows, not me. However, I'm sure some do. Leoleo R u joking ? Doing well wat biz ? Still 25% of profit is very good considering the size of CBM reserves. 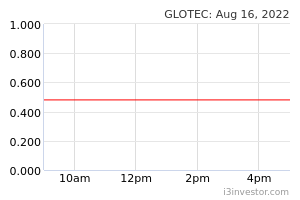 Glotec is also doing well in the other fronts.